Advanced imaging of the microscopic motion of water molecules in the brain shows promise for detecting these subtle injuries. A new study of TBI using this diffusion magnetic resonance imaging (MRI) technique will get a quality control boost from the National Institute of Standards and Technology (NIST), which has been working in collaboration with other organizations for nearly a decade to improve quantitative measures for MRI. NIST has developed a series of MRI "phantoms" to enable measurements that can be traced to international standards. Phantoms are stable reference objects designed to mimic human tissue responses to MRI, but in a predictable, repeatable way. They are used to calibrate MRI scanners. As interest in quantitative MRI measurements grows, NIST phantoms are being tested around the world, used in U.S. clinical trials, and transferred to industry. The goal is to improve image comparisons across scanners, test sites and time, thereby enhancing quality of care and reducing medical costs. NIST has applied for a patent on its basic phantom design and use to help promote commercialization. NIST and collaborators have already developed a phantom for diffusion MRI, which is now being tested in Europe and the United States. "It has shown very good reproducibility so far," NIST's Michael Boss says. "Diffusion MRI can reveal differences between tumors and normal tissue. But until now, there has been no widely accepted phantom or traceability to standards. NIST's expertise lies in phantom development and what characteristics they should have in order to determine sources of error and inform protocols to be used with MRI patients." A new quantitative MRI study, co-led by researchers from NIST and three other institutions, will look for evidence of brain injury in patients with suspected TBI. The two-year study is part of a Department of Veterans Affairs (VA) effort to reliably diagnose TBI and predict outcomes and care needs. The study requires the creation of a new, head-sized MRI phantom to measure anisotropic diffusion, which tracks water molecules as they move in specific directions through the brain. Their motions can reveal structural information such as abnormalities in neural pathways. Nerve cell damage is believed to be a driving factor in TBI. 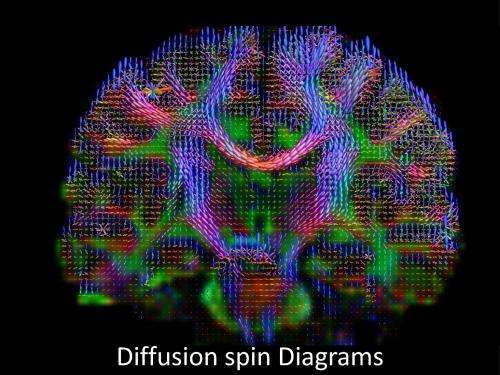 Diffusion imaging has revealed changes in brain structure in some people with mild TBI; researchers say it has great potential to characterize and quantify the integrity of brain tissue. The TBI phantom will be more complex than previous NIST phantoms. It will combine aspects of NIST's existing diffusion phantom with those of a University of Pittsburgh model made of textile fibers that measures both restricted microscopic water diffusion within nerve cells and unrestricted water motion between cells. When nerve cells are injured, the water motion that is usually restricted by cells is then able to move in an unrestricted manner. The MRI imaging technique used in the new study can detect this change. The new phantom might also be used to provide confidence in MRI diffusion measurements in other patients such athletes with possible head injuries. Once developed, the TBI phantom will be tested initially on MRI scanners made by different manufacturers. Plans call for eventual recruitment of veterans for a clinical study at four VA hospitals. "The study is highly relevant to the VA Hospital System commitment to provide a high level of care for veterans with suspected TBI," the research plan states. "It will allow a means to optimize scanner performance across the VA system and provide more uniform data from various scanners. 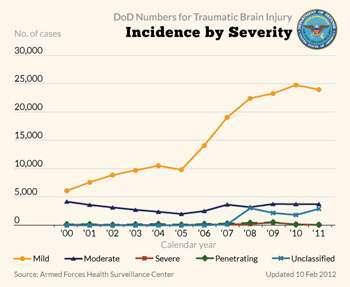 Meeting this goal will, for the first time, allow large collections of TBI data to be combined into a single pool. Analysis of the resultant large pool of data is expected to yield important results in terms of early diagnosis of TBI, stratification of patients into treatment categories, assessment of therapeutic results, and data for long-term outcomes trials."